A what? A Cuddle Party. It's warm. It's wonderful. It's a worldwide trend. A Cuddle Party is a gathering of people for the sole purpose of connecting and sharing some hugs and cuddles. Why? Because it's very good for you. Why else? Because it feels so very good. Why else? Because too many of us are seriously deprived of human touch, let alone nurturing hugs and safe, connecting cuddles. Okay, be sacred, be shy, let all your defences fly up - and they will. "I'm not hugging strangers," I hear you protest. "Surely people have other things on their mind." Listen to it all - and let it go. Cuddle Parties - led by a Certified Facilitator who has undergone extensive and comprehensive training - are warm and wonderful. They're a sure way to make sure you get your fair share of hugs in a non-threatening way that makes you feel warm, fuzzy, grounded and loved - and we could all do with more of that. So many people are sadly so isolated, they've forgotten how to really relate to others, let alone share physical touch. 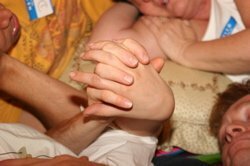 Cuddle parties help you re-connect with yourself and the rest of the world. They help you feel like part of the planet when life's problems can make you feel that you aren't. Unless you live in a totally loving, supportive and hugging environment, you're probably not getting your fair share of hugs. Still not convinced about the healing power of hugs? Then why have more than 30 million people travelled long distances and waited for hours in queues to be hugged by Amma, India's hugging saint? So, what exactly takes place at a Cuddle Party? Firstly, nerves are normal. That simply comes with breaking out of your comfort zones. Break out anyway! Nerves pass. And if you go with a friend, resist the temptation to stay 'safe' and make them your cuddle buddy all night. 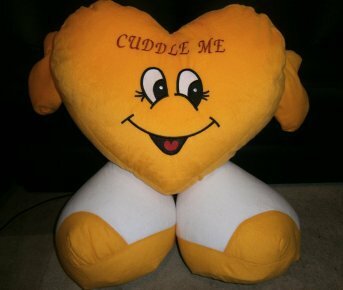 There are plenty of cuddle buddies to be had. A Certified Cuddle Party Facilitator helps everyone feel safe by reading and discussing the rules. For instance, given the aim is warm, connected touch - and nothing further - full on kissing is not allowed, while a friendly peck on the cheek, or a kiss on the hand if someone asks or offers it, is permissible. He or she will also help everyone relax by leading a series of connecting and relaxation exercises. This is very important for helping everyone feel present and safe. A good facilitator will also encourage huggers and huggees to very clear about what they do and don't want. So if you don't want to be hugged by a certain person or be in a particular situation, say no. 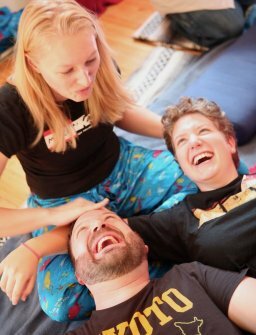 What to expect at a Cuddle Party? - Massage and massage trains. - Spoon lines, or lying side by side in a long line. - Laughter and tears . If the thought of a spoon line has your heart in your throat, please remember you don't have to participate in anything you don't want to. Everyone is different, everyone has different levels of openness and willingness to participate - and that's okay. So, who's cuddling and where? The cuddling phenomenon is catching on all over the world. We are, after all, all human and in need of affection. 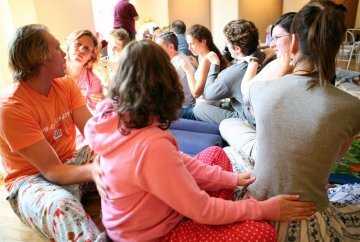 There are no Cuddle Parties in the UK at the moment, but Cuddle Nation run similar workshops there - and also through London Meetup. So, "Have you been?" I hear you ask. Indeed I have. My first hug felt so good, I cried. I also loved being part of a comforting cuddle puddle. I couldn't, however, muster up the courage for the spoon line - at my first Cuddle Party that is. "So, you've been more than once?" Indeed I have. And I dived right into the spoon line the second time. What a wonderful experience. It was very healing, like letting go and sinking into an all-encompassing, warm, safe embrace. everyone in the room connected to one another was very soothing. When one person moved or laughed, the energy reverberated down the line. After all, we are all connected - even if sometimes we feel like we're not. There were hugs and giggles, especially when we were all asked to turn and face the other way. Having arms, legs and limbs flailing every which way in a mish mash of humanity was hilarious. "Will you go again?" Stop me if you can. How about you? Sweet story and fully expected of a warm-hearted, like you. Good on ya.